Kuala Lumpur Convention Centre (KLCC) has always stood out in my mind as the huge convention centre and of course for shopping as well. Well, now KLCC specifically the convention centre will now stand out because of its amazing Ramadan buka puasa. My very first time having the Ramadan feast here but I must say that the ‘Kampung Classics’ feast prepared by the Centre’s award-winning brigade of 51 Chefs is definitely amazing and value for money. 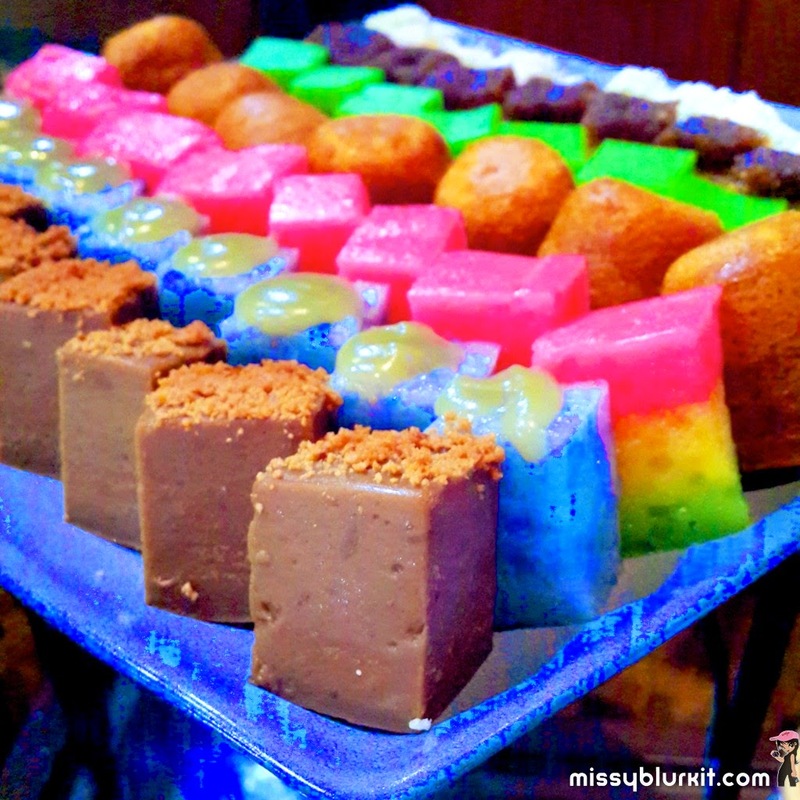 Taste wise, the chefs have definitely replicated the traditional offers that one would expect and experience in a traditional kampung. Literally speaking, its definitely ‘Kampung in the City’ experience. 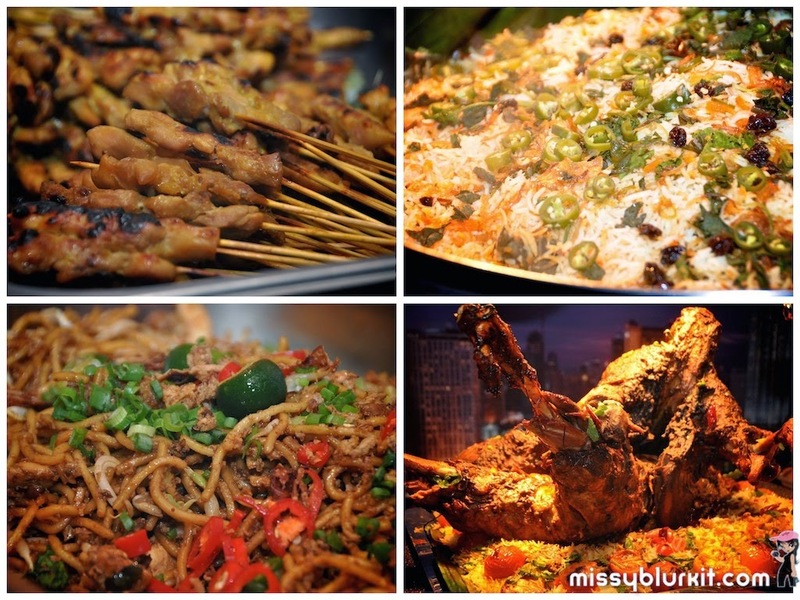 Not to be left out is also other cuisines from KLCC's other kitchens including Western, Chinese, cold and pastry. Prices will range from RM99.00++ per person for the delectable Ramadan Al-Mubarak menu to RM135.00++ per person for the exquisite Ramadan Al-Kareem menu. 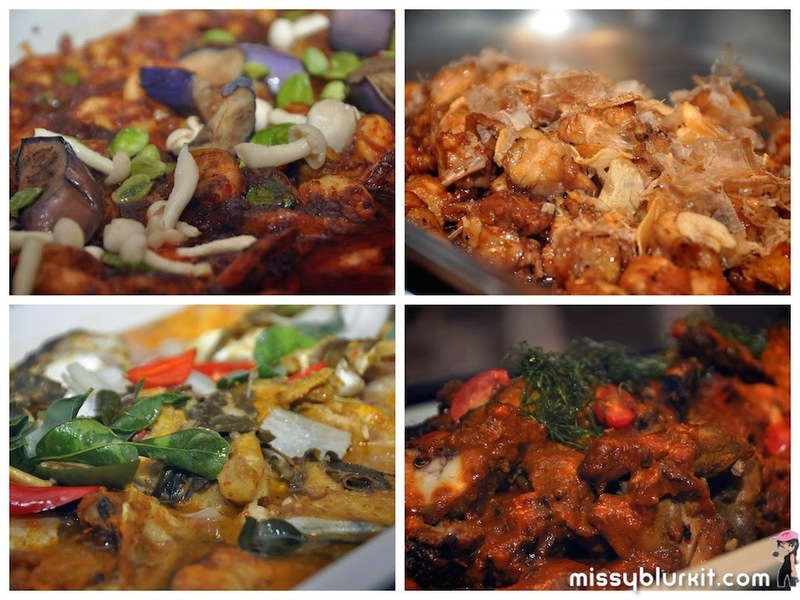 Signature dishes will include Ayam Panggang Percik Gula Kabung, Dendeng Goreng Berlada, Rendang Tok, Ikan Pari Asam Pedas Ramadan, Nasi Briyani Kambing and Udang Goreng Bersama Kuah Pedas Kicap Manis. 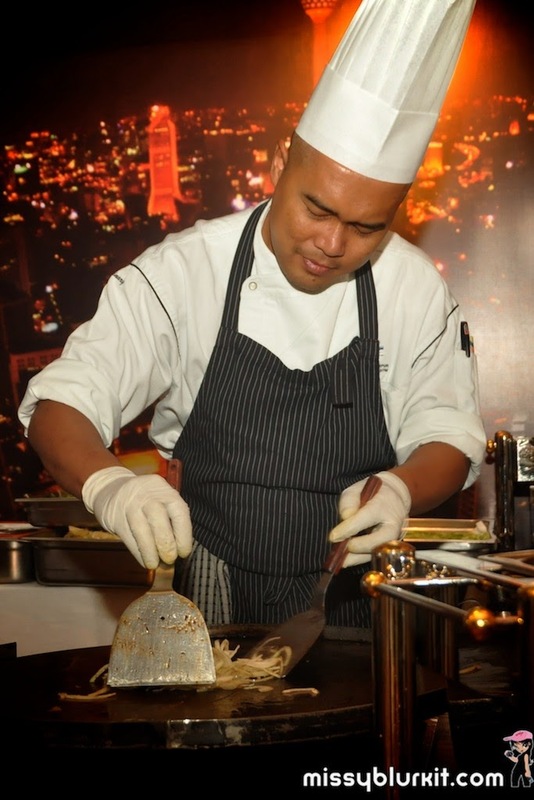 Guests can look forward to our ‘Chef Action Stations’ where local favourites such as mee goreng mamak, Penang char kuey teow, Hainanese chicken rice, assam laksa, mee curry Nyonya, prawn mee and wantan mee, chicken and beef murtabak, roti bom, roti jala served with chicken curry, dhall curry and sardine sambal will be prepared right before you. A note worth mentioning is that the bubur lambuk and patin masak lemak at KLCC is definitely one of the yummiest that I have had. In fact, many others concurred with me too that these 2 dishes were exceptionally good compared to many restaurants! To complete the meal in style or even to begin on a lighter and sweeter note, diners can also opt for the dessert corner. This is one very well thought corner that includes the ‘Goreng Gorengan’ station to enjoy banana, jackfruit (cempedak) and bread fruit (sukun) fritters and keropok lekor. 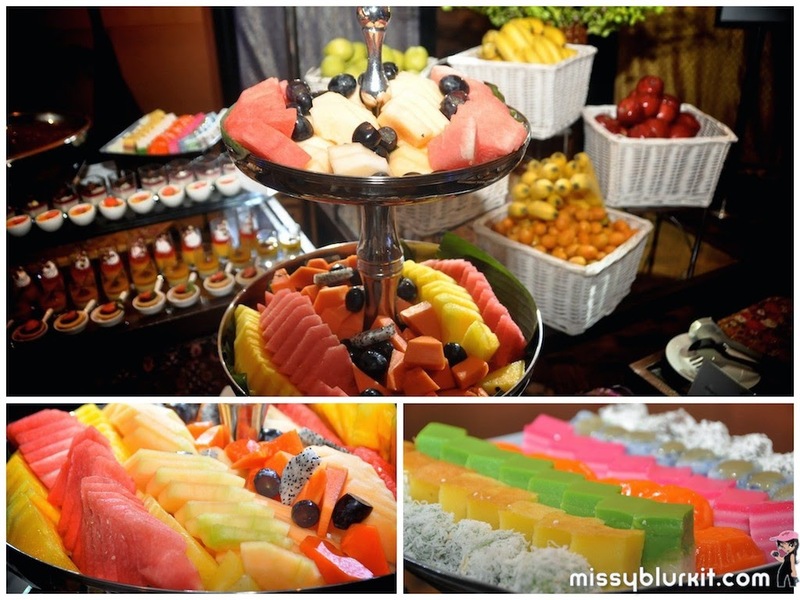 The other works includes sumptuous serawa durian, local kuih, cakes, pastries, fresh fruits, dates and many more. A strange plating of cuisines but I believe in breaking fast lightly and not over eating during the month of Ramadan. Keep a balance of what you pile on your plate. 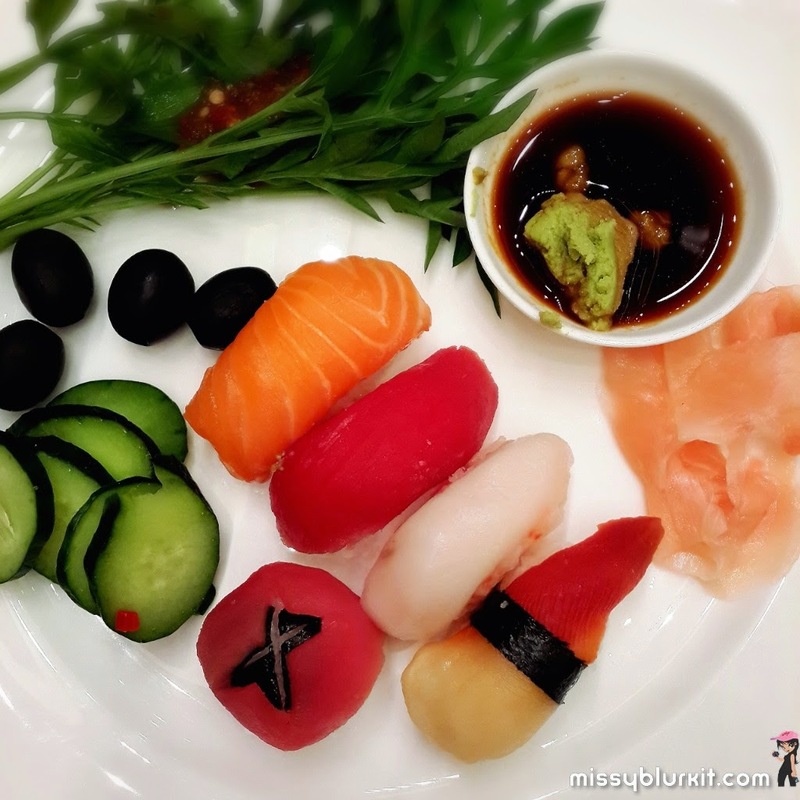 Remember to eat rainbows like this plate of Japanese cucumber, olives, ulam and sushi. It was an interesting topic during one of my morning runs recently..."Can fasting Muslims still train during the Ramadhan period?" I wouldn't put down a hard and fast rule or either a YES or an NO. It really all depends on individuals. Read on to hear what my fellow runner Ana Fauzi has to say and also an interesting infographic by the organisers of the coming Standard Chartered Kuala Lumpur Marathon. Ramadhan or fasting month is a special month for Muslims. During this blessed month, Muslims are obligated to fast every day from dawn until sunset. Fasting for the entire month is definitely not that easy. You will get tired and exhausted. However, that doesn't mean we're not able to do our normal daily activities. I don't like the thinking that fasting will make you underperform. So usually I will try to stay active as much as I can. Last year, I had a mission to run during fasting month. At the first attempt, I wasn't sure but I wanted to give a try. I've been training and running Double Hill (DH) route for a few months before that and I was pretty sure that I can run during Ramadhan too. 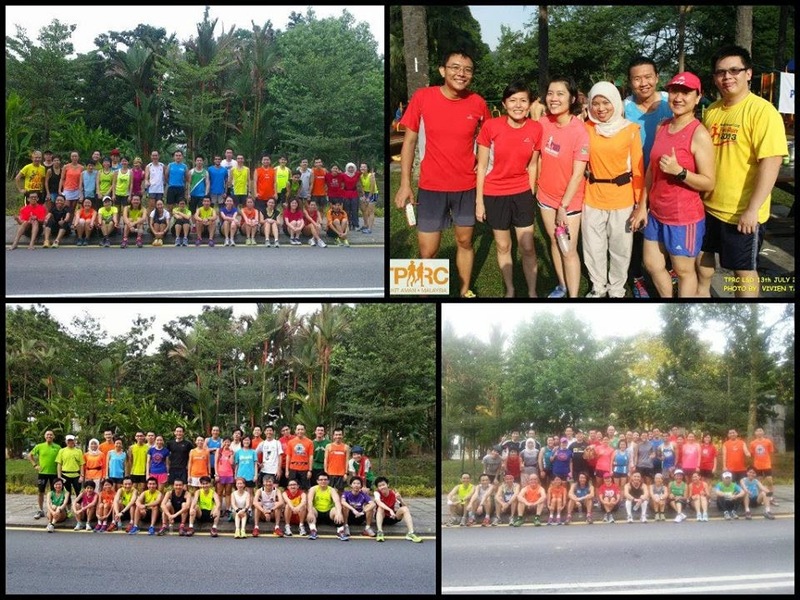 So I joined TPRC friends running 10km DH on the first Saturday of Ramadhan. It was trial and error. I thought I will get exhausted by noon and will sleep the whole day but surprisingly I was not. I was fresh and active until night! Survived on first day, so I did it for the entire month. I also tried running in the evening before breaking fast on weekdays. However, I prefer Saturday morning runs better. At any time, it's actually doable. Of course, I had to make sure I eat and hydrate well. I made sure I break fast with dates and water. I also made sure I drink a lot of water during break to stay hydrated between Tarawih prayers, after prayers and during sahur. For sahur, my meal was two half-boiled eggs, dates and lots of water. Dates and water are the most important foods for me during fasting month. I do feel that dates helped me survived after the run until Iftar (breaking fast). By the end of Ramadhan, I've completed my mission running on all four weekends of fasting month without fail. It wasn't easy, yet it was a wonderful self-discovery. I have found that it feels fine. I truly believe that our body can stand almost anything, it’s the mind that we have to convince. As a matter of fact, I clocked my personal best at DH in 1:09 on fasting month! Feeling accomplished!! Pic of Ana running with us throughout the fasting month for 2013. And if you are wondering why does Ana choose dates? 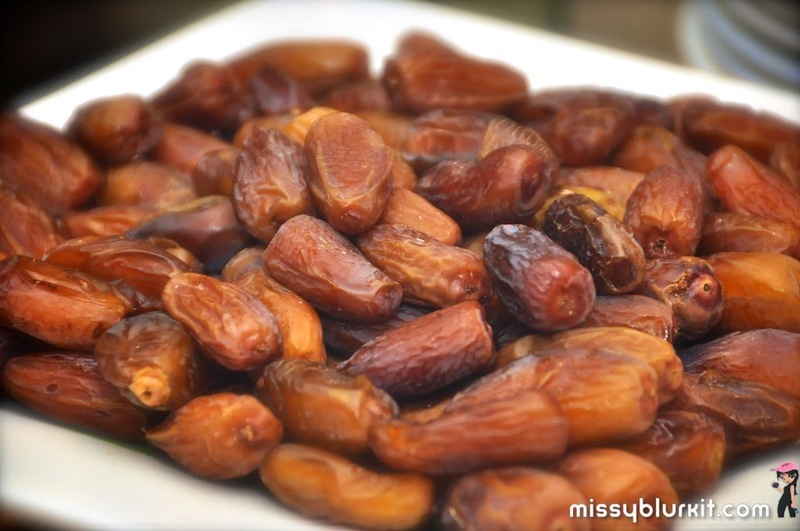 From a religious angle, Prophet Muhammad has recommended that one breaks fast with dates. Scientifically, its been proven that breaking fast with dates is indeed beneficial during the fasting month. • Dried or fresh dates naturally have high levels of sugar which can be easily absorbed by the body. This fuels the person who has been fasting the whole day and will need quick energy to enable him or her to get about performing their prayers etc. • Dates are rich in vitamins A and B6, folic acid, potassium, natural sodium, iron, and magnesium. • Dates are also high in fibre and can help to reduce or prevent constipation when taken with sufficient water. • Space out the hours - running is only after 2 hours after you have had your meal. • Run late at night or early in the morning. Avoid running during the day time. • One should opt for quality runs rather than going for long runs. Do head on over to the following channels to stalk me and for more updates on SCKLM and my runs! I am not your fashionista but during my short stint in Gold Coast, Australia, I certainly experienced the life of a fashionista. Not in a dressy manner since I am pretty much a shorts and tee or sundress kind of girl aunty. 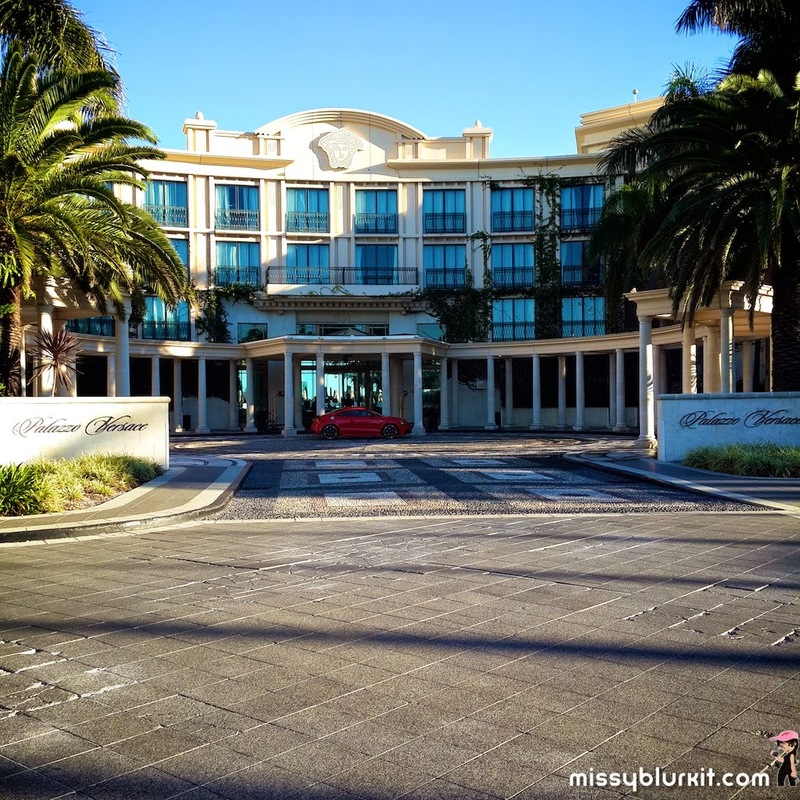 Stayed at the posh Palazzo Versace. This luxury hotel the world’s first fully fashion branded hotel by is the world famous House of Versace The hotel’s interiors feature House of Versace designs and reflect the vibrant colours, patterns and styles of Versace, including the iconic brand’s Medusa head found throughout every room. 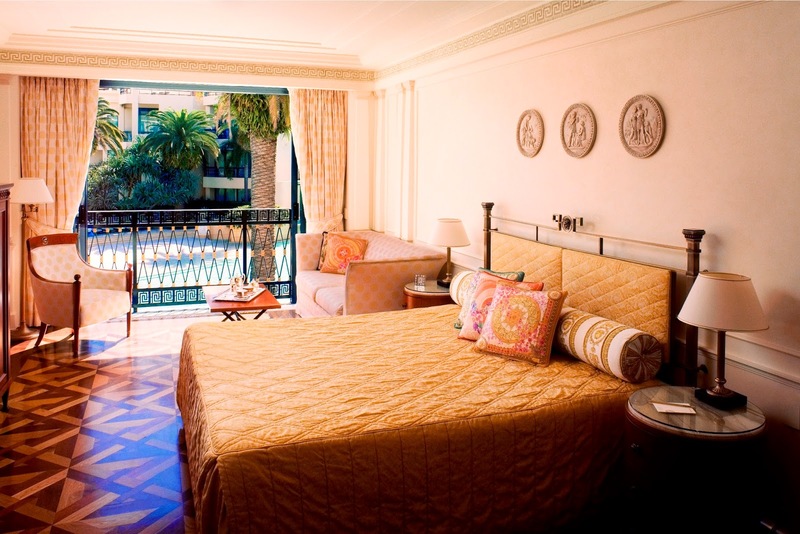 Each hotel amenity is designed and branded by the House of Versace as a constant five star fashion reminder to the hotel’s designer heritage. 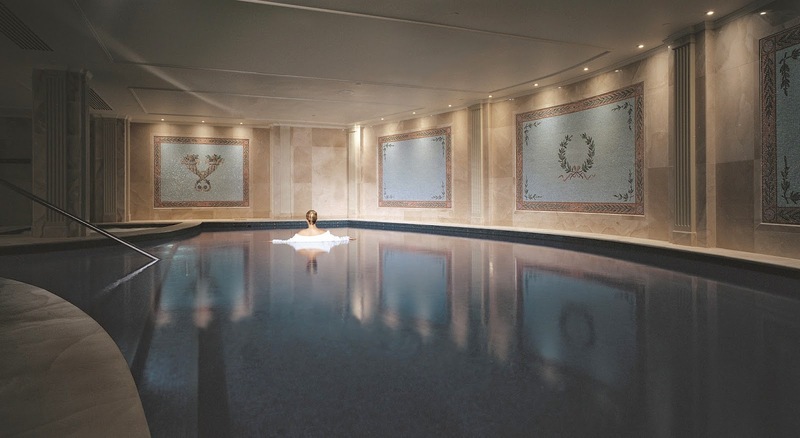 Palazzo Versace houses three award winning restaurants; Vanitas, Vie and Il Barocco and a luxurious lobby bar, Le Jardin which offers couture cocktails and haute high tea which I will share in separate posts in the near future. Even though I arrived late at night at approximately 10pm, it was no doubt that in the warm lights, this place was chic and luxurious. With 200 classically chic rooms and suites, 72 neighbouring condominiums and a private 65 metre lagoon, this is a huge property despite an entrance that looks deceivingly small. Entrance at 730am after my run. Of course I ran during my trip. There is a beautiful route on the boardwalk and beach within 2 minutes walk from the hotel! In fact its also part of the coming Gold Coast Airport Marathon which happens on 4-6 July 2014 of which I will be running. My room then. Its luxe and cozy. So cozy that I honestly had problems waking up every morning for my runs. 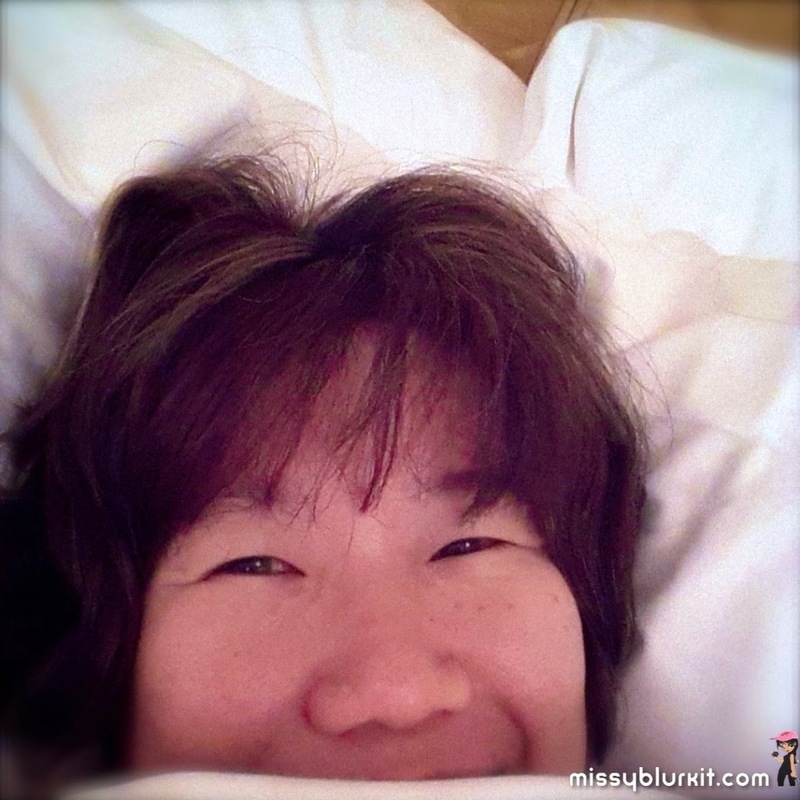 Its much discipline and persistent phone calls that got me out of bed each morning! And with such details every night placed in my room, how could I not have a good night sleep and also be tempted to wake up early? 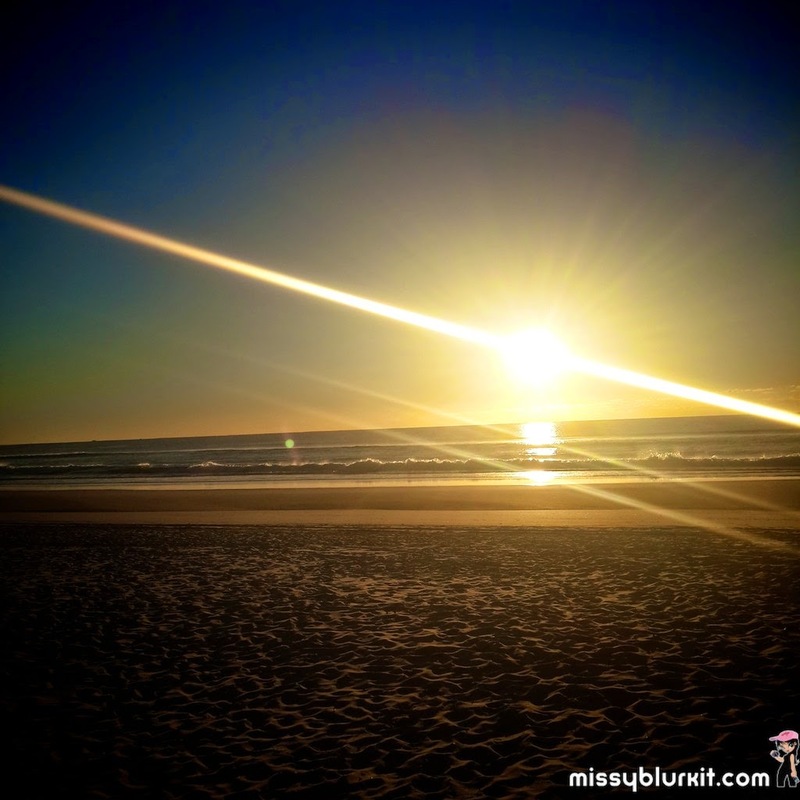 My reward each morning is a beautiful sunrise along the beach. 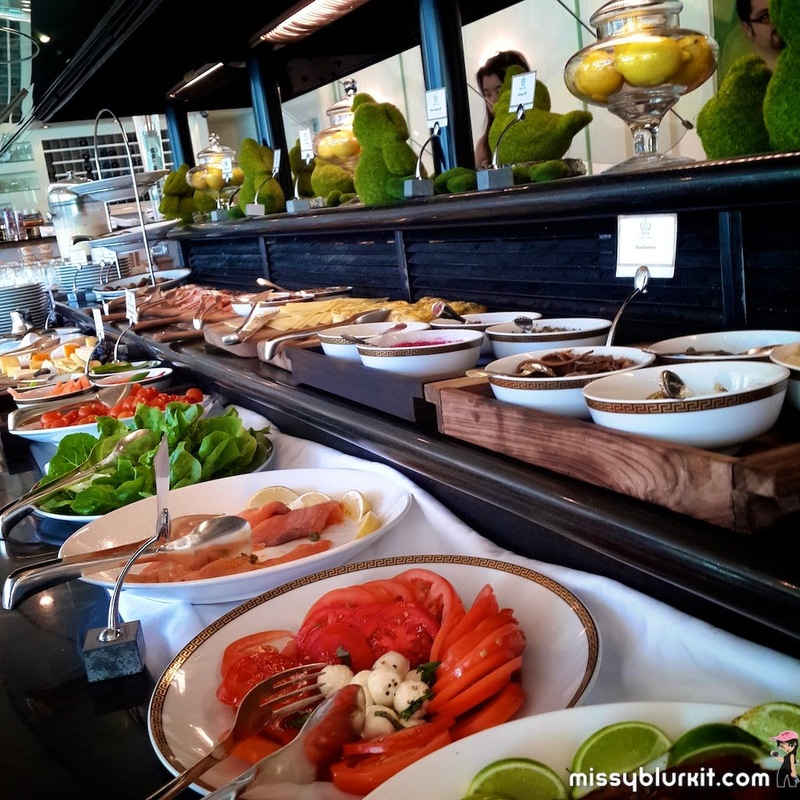 Delicious brekkies every morning at Il Barocco. Loved the fact that there was some good options of gluten free and vegan options as well. 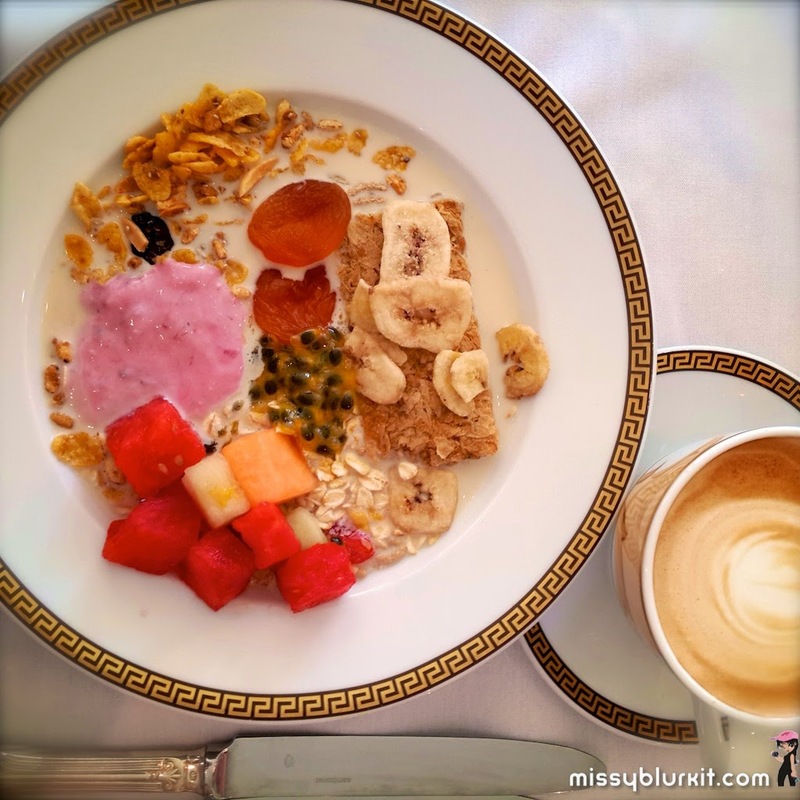 I am a creature of habit so each morning it was definitely a delicious and healthy brekkie with an equally good cup of coffee! Awesome flat white here! 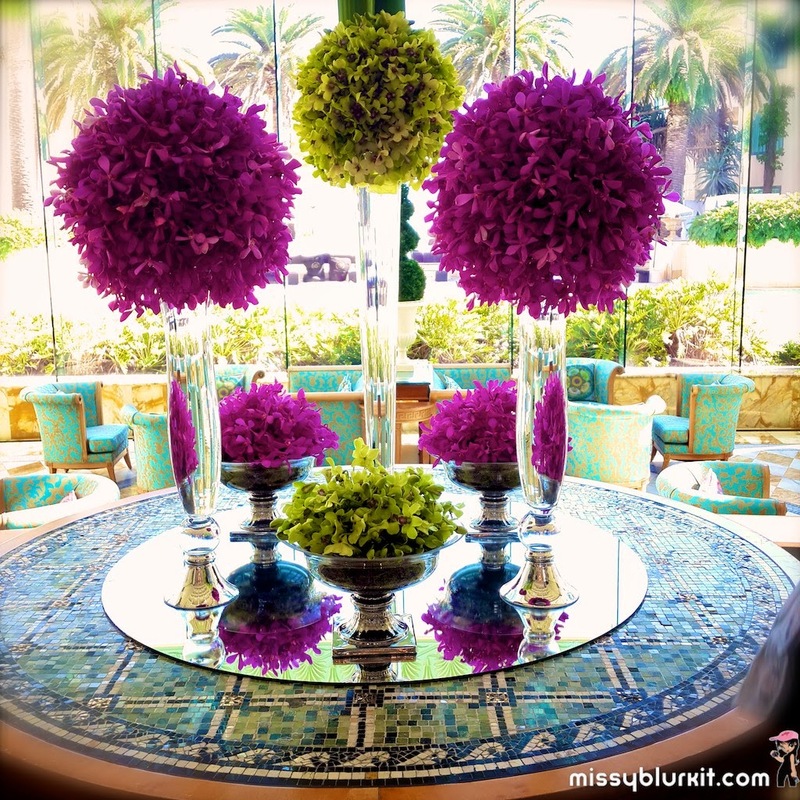 Beautiful orchid arrangements in the lobby. They are such a beauty to admire. The orchid blooms are just as pretty at night. With added candle lights, it pretty much a nice romantic mood set as well. 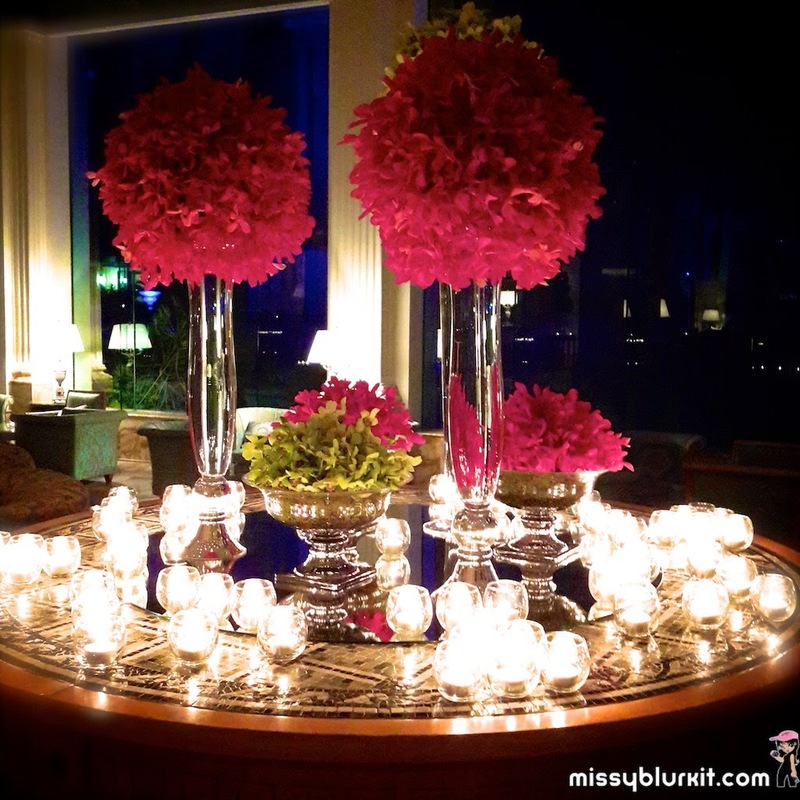 Perfect for an evening of drinks too at the luxurious lobby bar Le Jardin that gives a good view of the beautiful lobby. Touched down late in Gold Coast but thankfully there was still light bites and drinks at Le Jardin. 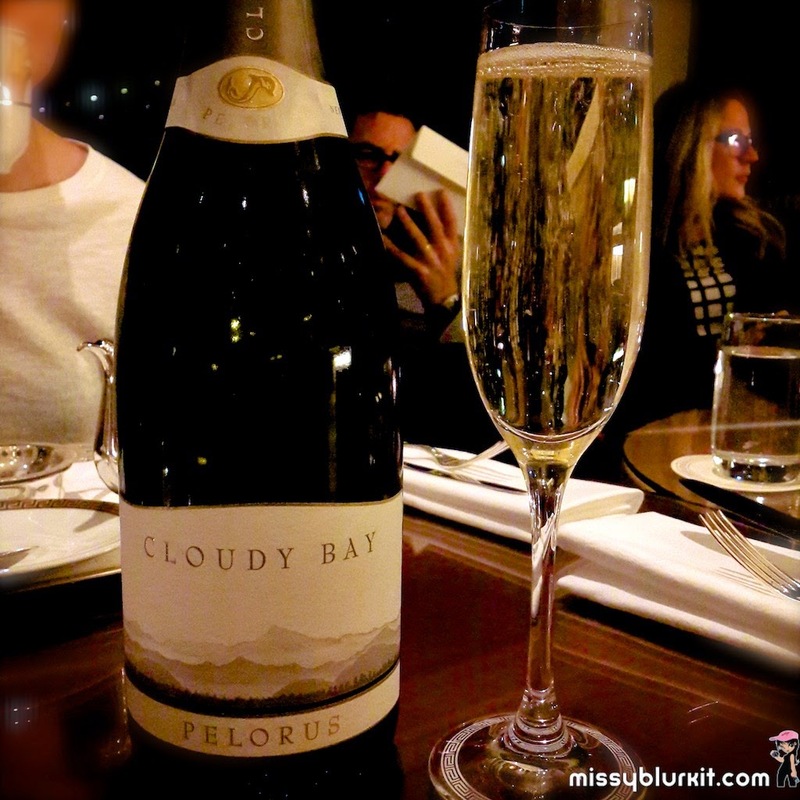 A wine is just perfect to unwind with impeccable service by the waiters. 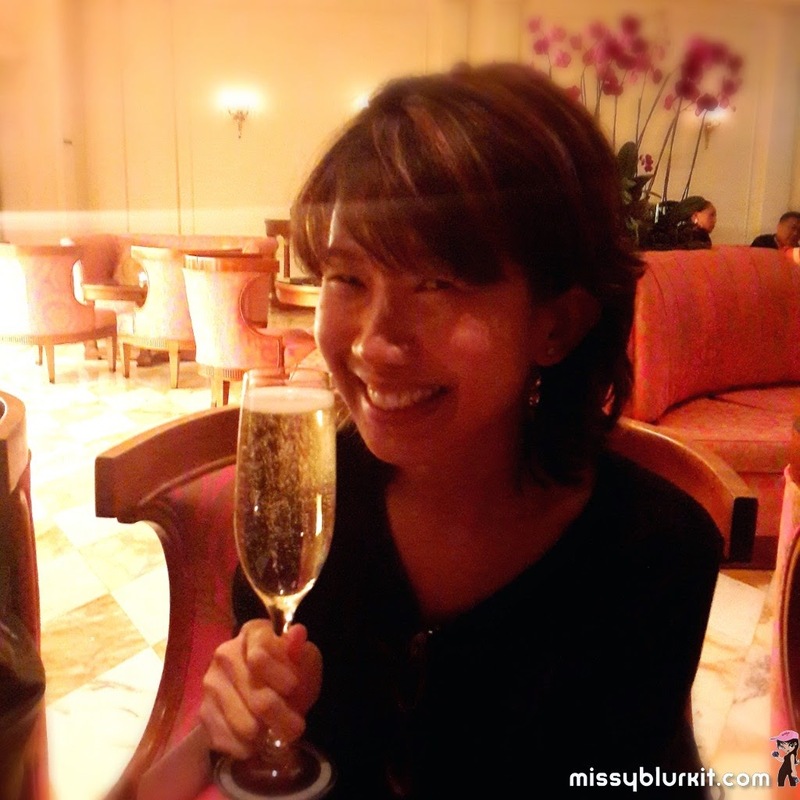 My first selfie from Palazzo Versace! 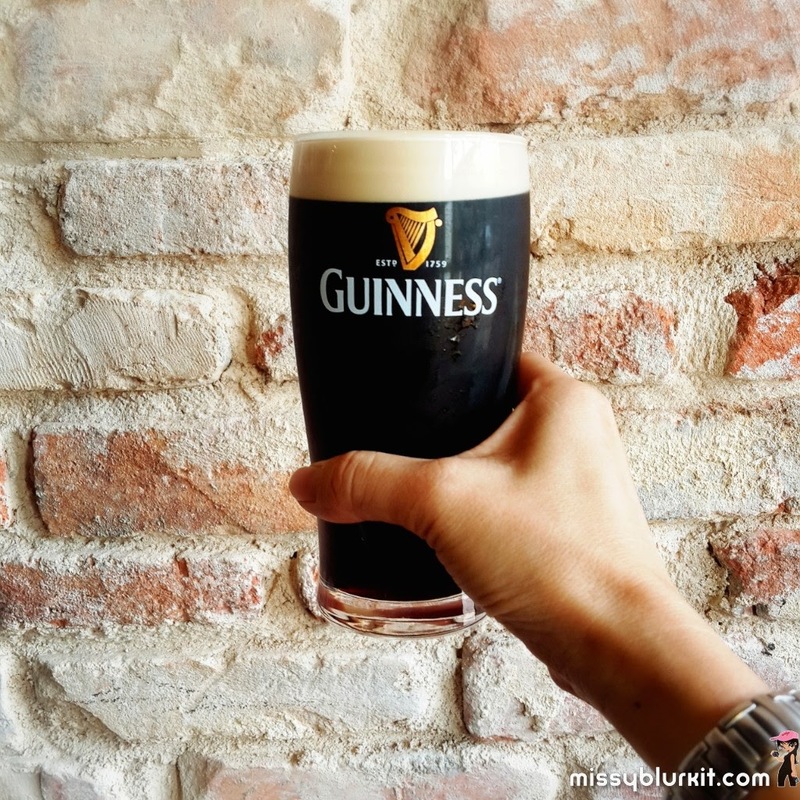 Cheers to more good times, folks! A view from my room. Very inviting pool! 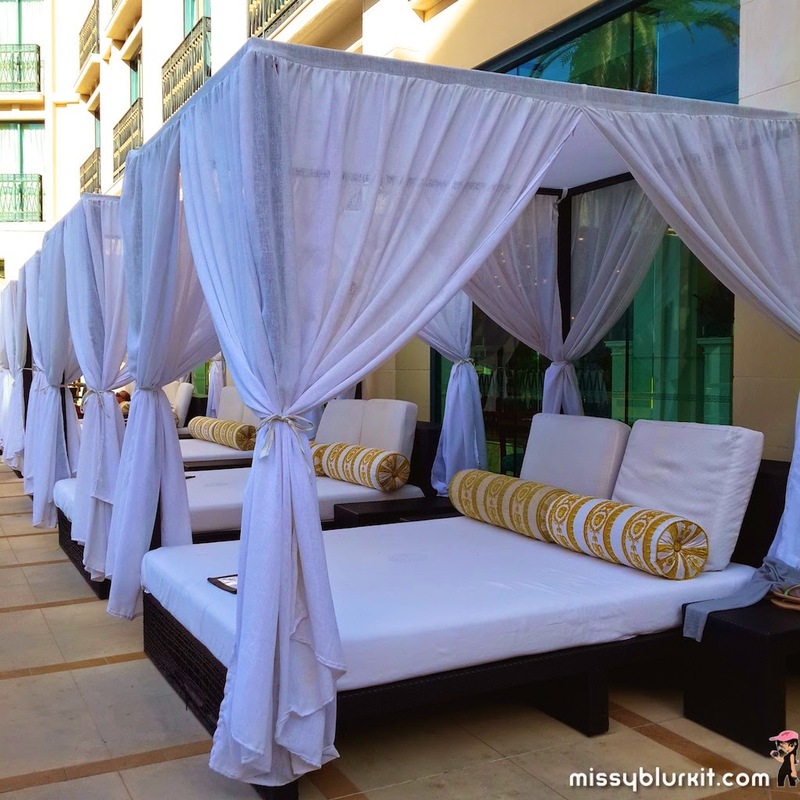 Equally inviting were the cabanas facing the pools. Perfect if you don't want to mingle with the crowd at the beach. 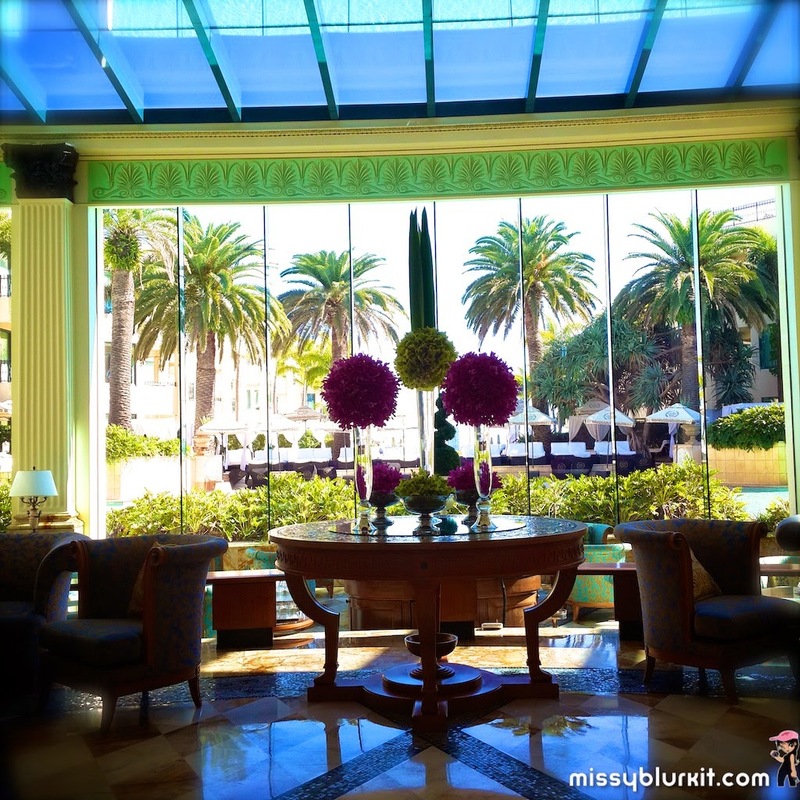 A favourite of mine would be the Vie Restaurant at Palazzo Versace. 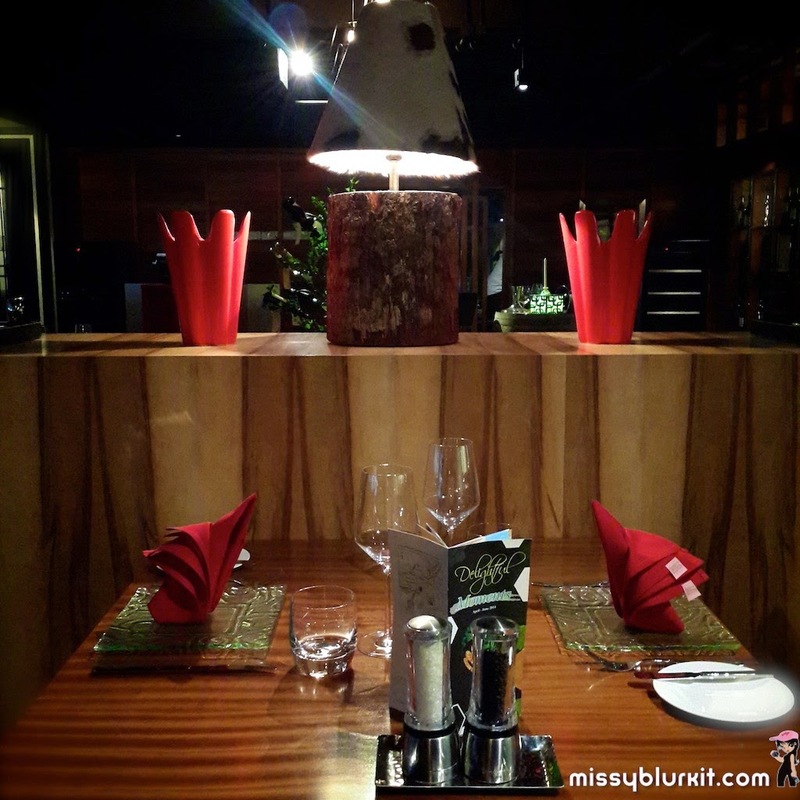 With a view of the lagoon, its a lovely spot to dine both day and night. During the day, sit outdoors to soak up the sun and view with a good glass of white to go with your meal. Stay in at night in case it gets too chilly for your liking. 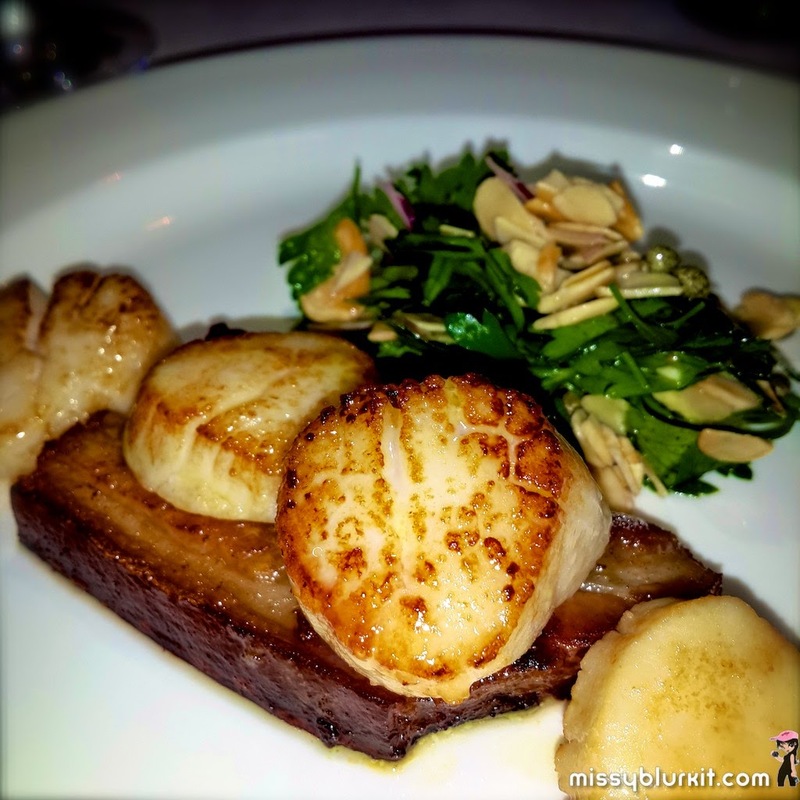 Highly recommended on the menu is this seared scallops with braised preservative free bacon! A brilliant combination and perfectly executed. Dang, on a return visit I will want to have this as a main dish instead of being an entree! 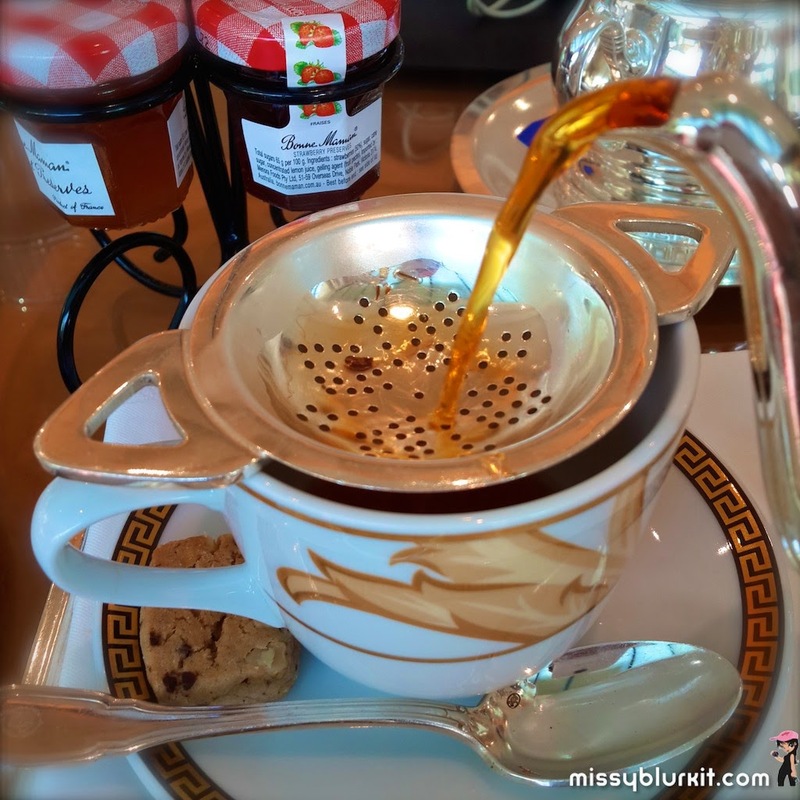 Couture High Tea experience! 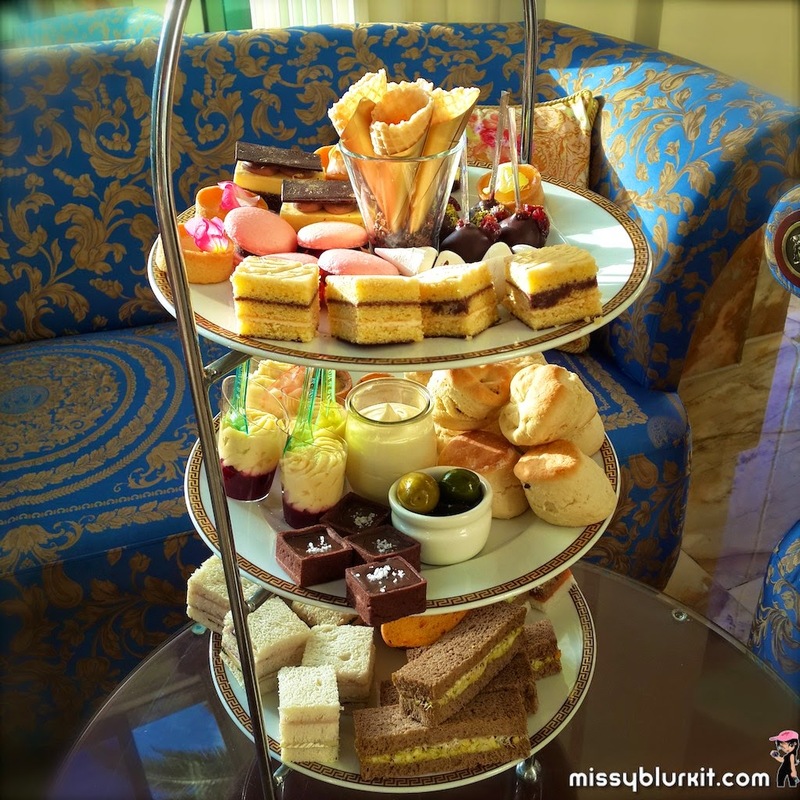 That's indeed the style and high tea at Palazzo Versace. Available daily from 11am to 5pm at Le Jardin. Love the carefully chosen and delicious offerings on each tray. The entire platter is a daring play of texture, colours and flavours. Very Versace! Coffee or tea? Its obviously tea for me! Each day in Gold Coast was filled with activities. The best to do each night was to have a good wash. The bath tub came in handy for the nights and the showers for my morning. Best of it all, I didn;t even have to pack any fragrance for this trip since everything was Bespoke. 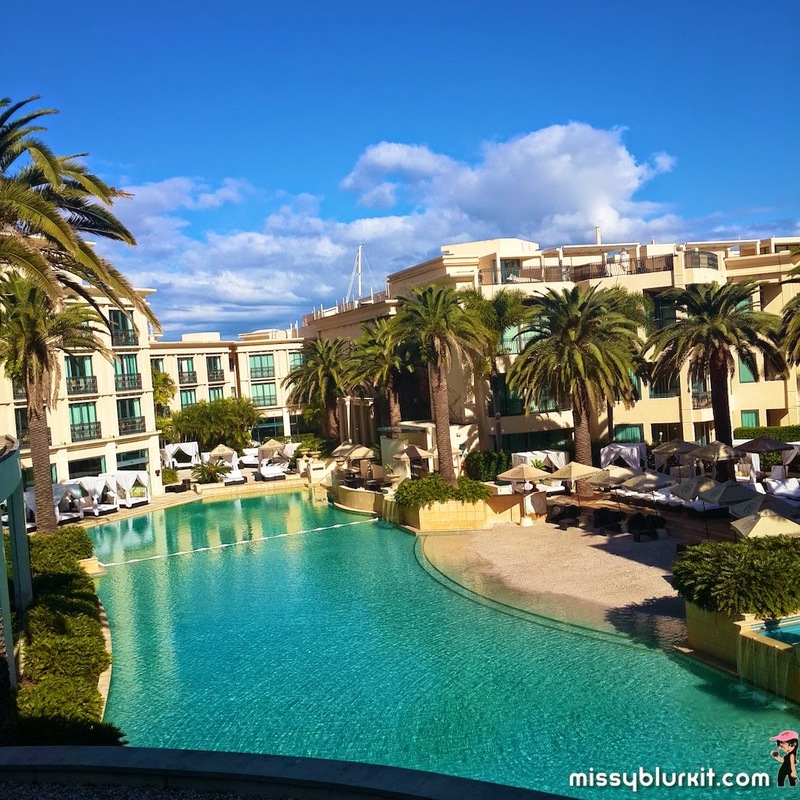 My stay at the world's first fashion inspired hotel Palazzo Versace is certainly memorable. 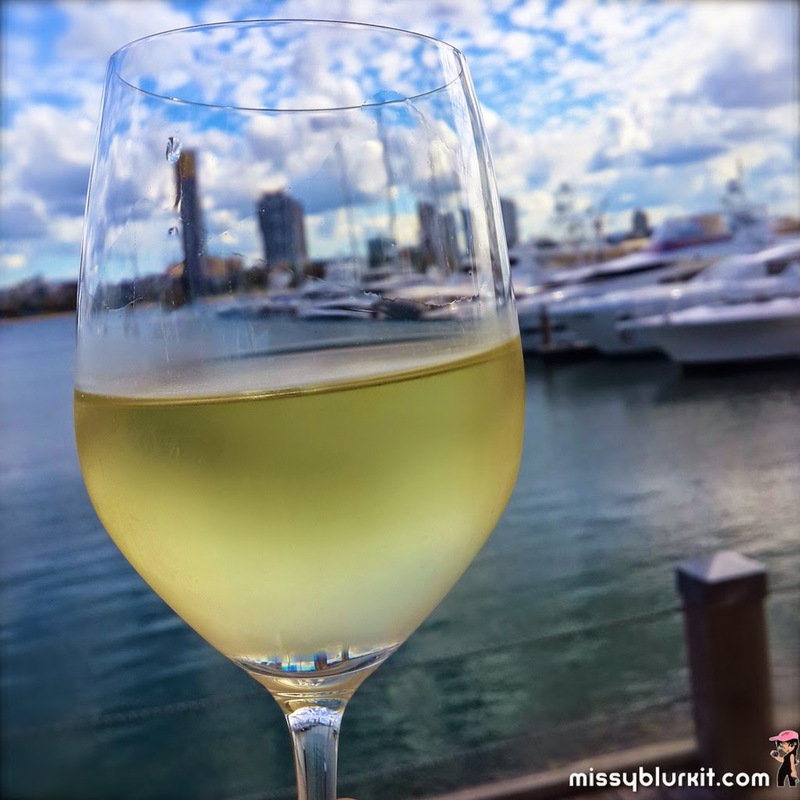 Highly recommended when one visits Gold Coast. And for those heading in for the Gold Coast Airport Marathon next week, check out the special package for runners! Yes...its fashion and fitness combined! Option of an additional person is an extra $60. One sets up a business to make money. The rare ones will take up the challenge of those who make the bold choice to set up businesses not focused solely on profit but on actively benefiting the lives and livelihoods of the communities around them. These are the folks that definitely deserve our applaud and support. It was a crazy hot afternoon on the day of the Entrepreneur for Good 2014 award. Somehow even under the hot sun, the awardees were so happily and passionately sharing with us their business and ideas. 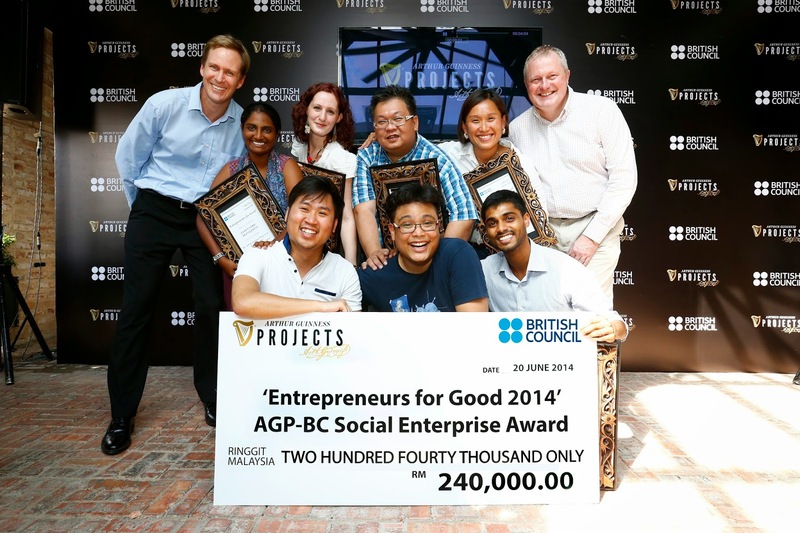 Certainly not a wonder that these folks were picked to each receive financial and business support up to the value of RM240,000 from the Entrepreneurs For Good 2014, organised by the Arthur Guinness Projects in partnership with the British Council. The six winning social enterprises are chosen from 20 semi-finalists after a nationwide search road shows and were given business mentoring and training over the last 6 months. The top 12 social ventures out of that were then selected to go into the final stages of the program. At a public pitch held in April 2014, the finalist then pitched their winning social business ideas in front of an expert panel of judges comprising of industry leaders and leading social enterprises out of which the final 6 awardees were chosen. Congras for each receiving between RM20,000 and RM40,000 each as part of this year long programme. 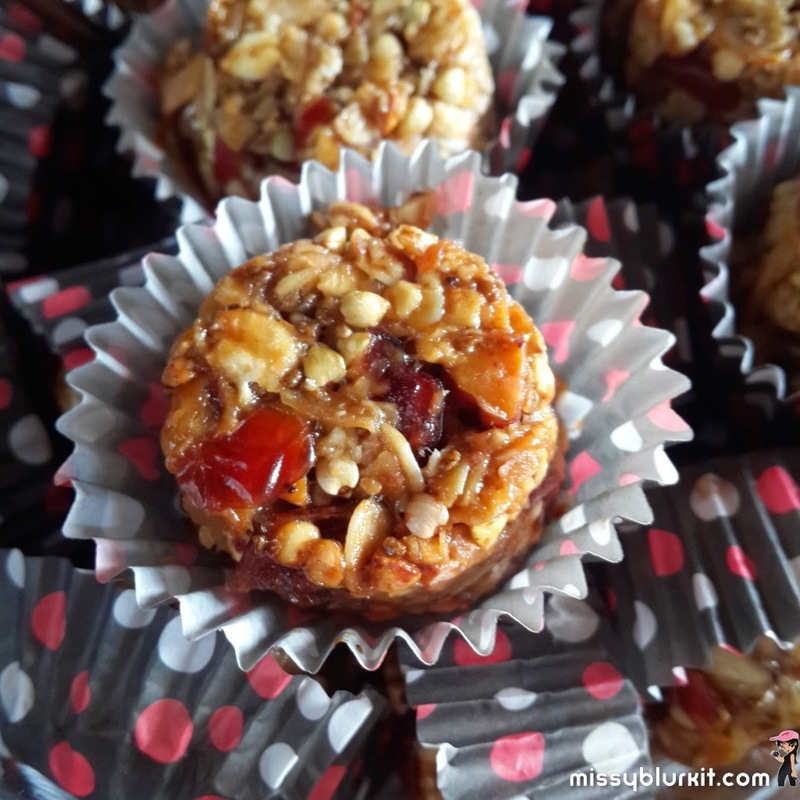 CleanBites serves delicious, healthy, and balanced food, with a focus on making this food easily available to the public. An innovative subscription-based delivery service makes eating healthily easily achievable and affordable to people living busy lives. General food are often high in salt, sugar and pther processed seasoning including GMF. 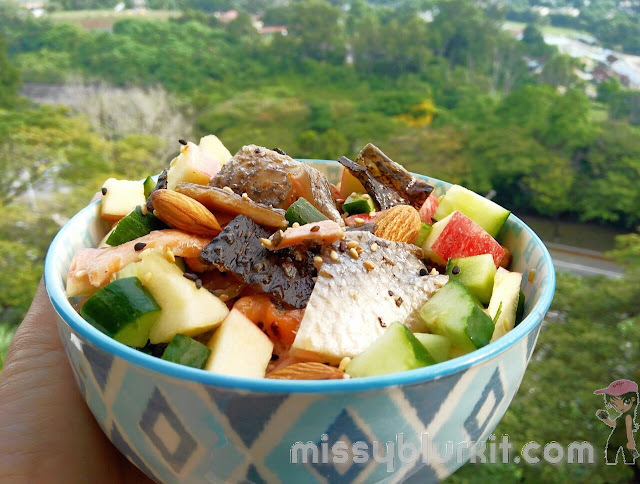 By educating the public about eating healthily and introducing them to great-tasting and easily-accessible healthy food, CleanBites aims to improve the health and well being of Malaysians. Catama Crafts works with women in rural, underprivileged communities within Sarawak to assist them in gaining economic stability through exploration of indigenous arts and crafts. By creating high-end products for the international market, Catama Crafts seeks to encourage the preservation of traditional knowledge and empower communities with pride in their craft and cultural identity and the autonomy to change and adapt. Crafts created will be marketed and sold to local and international consumers and profits will be shared with the rural communities, providing economic stability to the women and community at large. In addition, ensuring the preservation of traditional skills and knowledge. BYOB stands for Bring Your Own Bottles, an environmentally-friendly store built around the ‘3R’ concept of reduce, reuse, and recycle. BYOB seeks to educate society about the dangers of plastic pollution and to stop them from treating plastic bottles as rubbish. This enables the communities a chance to help protect the environment by reusing their plastic bottles instead of throwing them away. BYOB allows the public to bring their empty plastic bottles to the store and refill them with a variety of cleaning products. This comes from a study that recycling doesn’t really work as it creates a carbon footprint whilst in the recycling process. Furthermore, it is costly as well. Ecocentric Transitions is committed to cultivating an environmentally empathetic and sustainable society. Through workshops and consulting, Ecocentric Transitions aims to build environmental awareness in communities. Ecocentric Transitions educates and gives practical advice on how to become more eco-responsible through interactive activities relating to topics such as Food Security, Waste & Resources, Environmental Education and Sustainable Living. make use of public transport in a sustainable way. Focusing on the ‘First Mile Problem’ – the difficulty people face in accessing public transport from their homes - Busco provides communities with the opportunity to become mobile and live more fulfilling lives. Busco also seeks out unemployed and underemployed youth, and trains them to drive and manage the operations. Cheers to your future success. Keep up the good work of caring for communities in your business ventures! 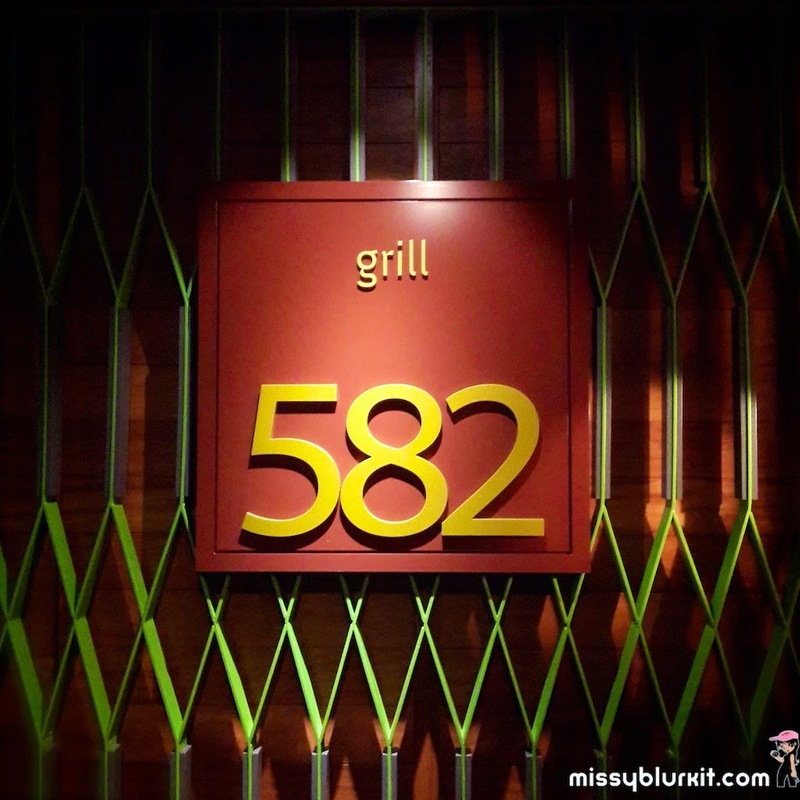 My first visit to Grill 582 and I was excited. There was something about the entrance and the signage. "Grill" as in cooking using a grill or was it "grill" as in the fencing used. Either way while my thoughts argued with each other I knew I was in for a surprise and truly it was a surprise that I could have a good set meal with wine pairing in Brickfields for a decent price. Indeed an extraordinary culinary offering. Love the lighting of the place. Its cozy yet comfy enough for us to take our food pics. I know, I know...bad table manners...but heck its fun to capture the moments of our good food! And the best about Grill 582, I get to choose my own steak knife. Too many to choose...and the hubster gives a simple answer "Come back and eat again so you can choose the other knife or knives you had in mind". Smart man! 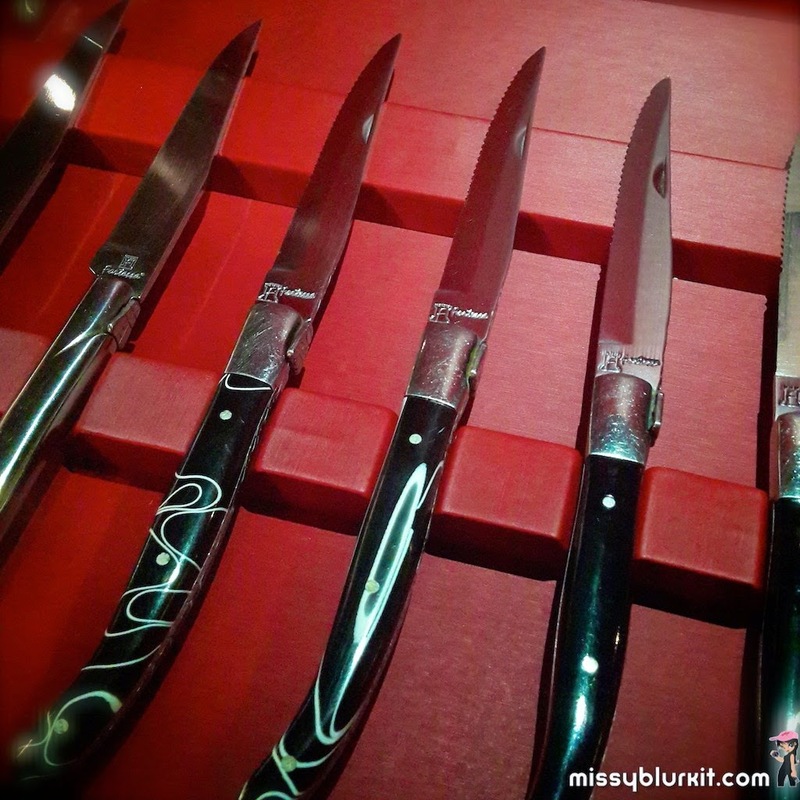 Love the different handles for the knives! 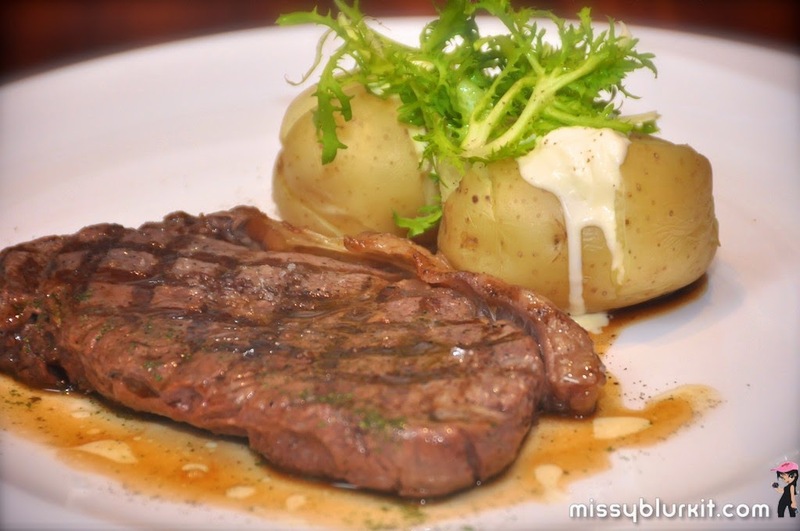 The Extraordinary Culinary Offerings @ Grill 582 runs all the way till end of June 2014. This special menu is crafted based on the best selling items at Grill 582 and a few are Sous Chef Siti Arini Darsom's latest creation that will be making their way into the ala carte menu soon. Take your pick of the special 4-course dinner menu is priced at RM250++ per person with wine pairing or RM180++ per person without wine. We opted for wine pairing for the 4-course meal. 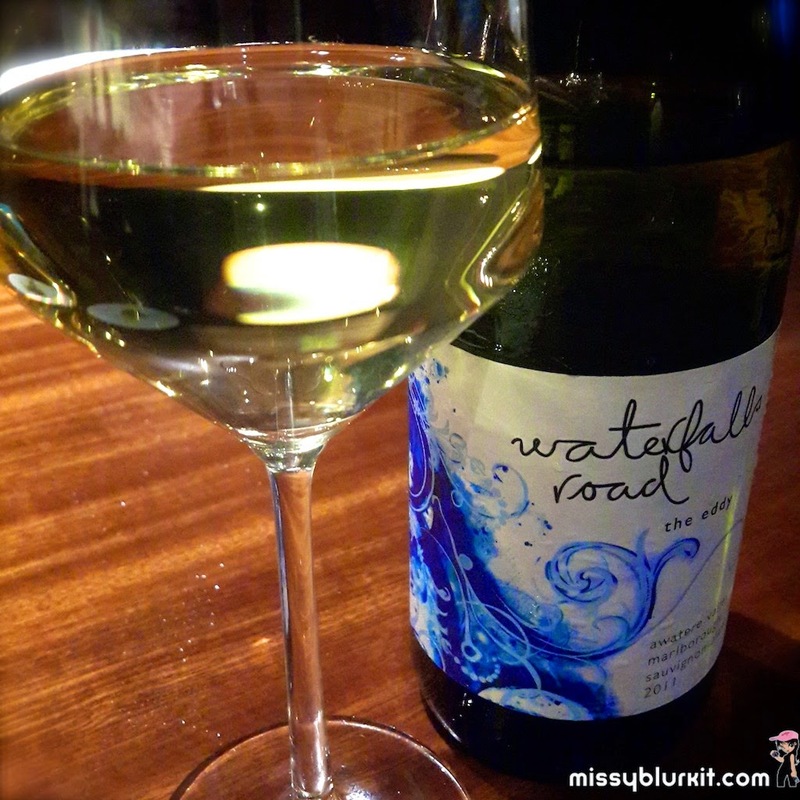 Between the red and white, I was honestly more smitten with the Waterfalls Road "The Eddy" Sauvignon Blanc. A lovely zesty finish to it with melon and peach flavours. It went well even with our choice of steaks. Undoubtedly it would have gone brilliantly with the trout too! There was 2 appetizers to choose from and since the hubster was with me, we could have one of each and share it. Yeah yeah...table manners in question...but we are foodies...so pardon us! 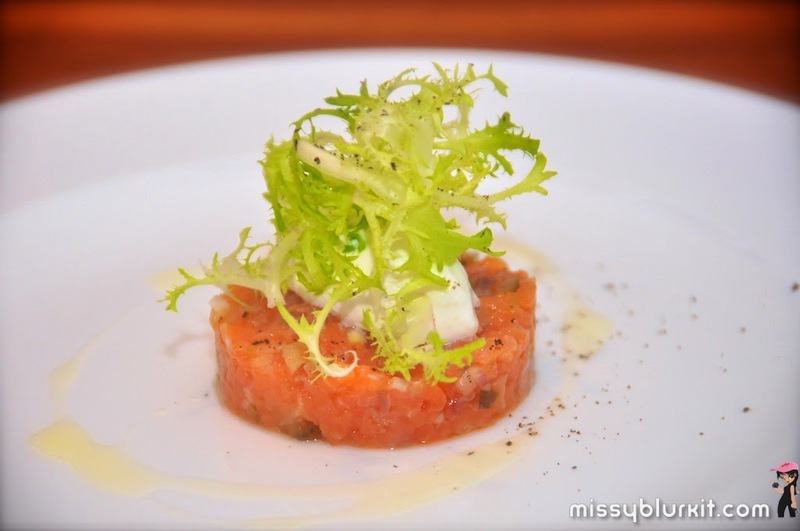 Scottish Smoked Salmon Tartare, Shallot, Creme Fraiche and Frisee Salad was a hit with the hubster who loved the rich salmon fats (good fats!) with a hint of smokiness. Somehow having a smoked salmon tartare coupled with the ingredients gave him a new opinion of smoked salmon. 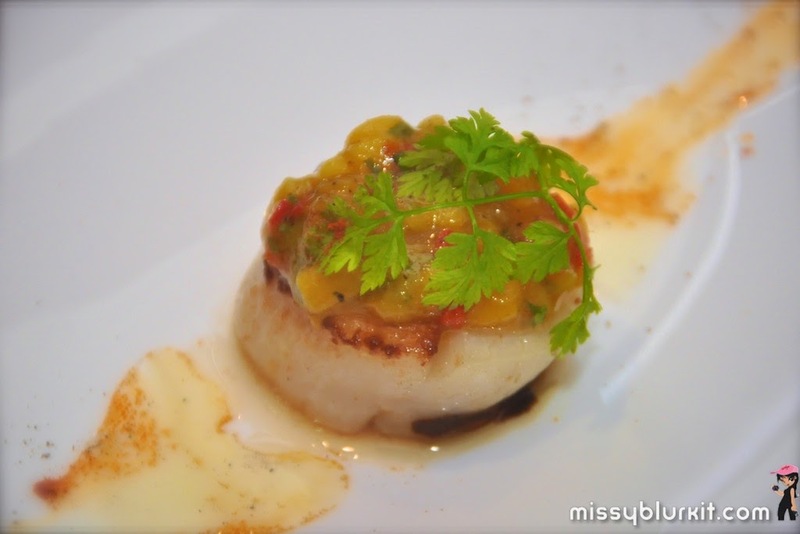 The plump and perfectly pan seared Scallop, Mango and Chilli Salsa was my obvious choice. 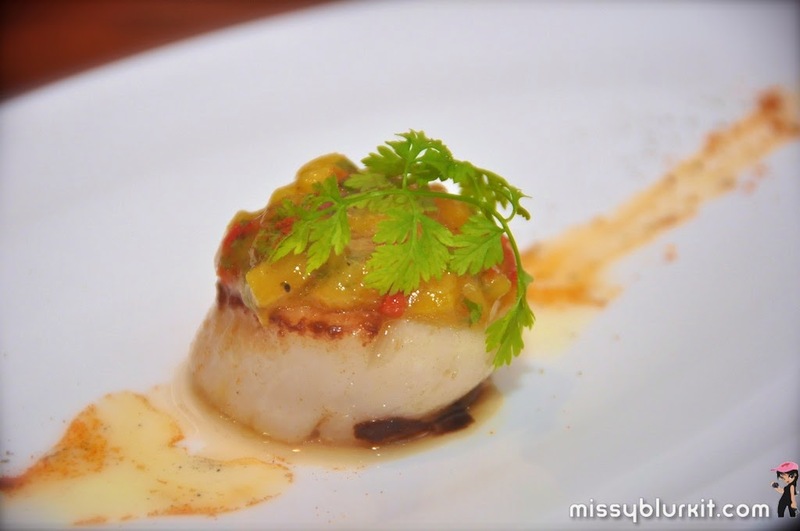 This is definitely something I will return to Grill 582 to for and perhaps have it as a main instead of appetizer!Mango and Chilli Salsa. Always good to have a soup in a meal. 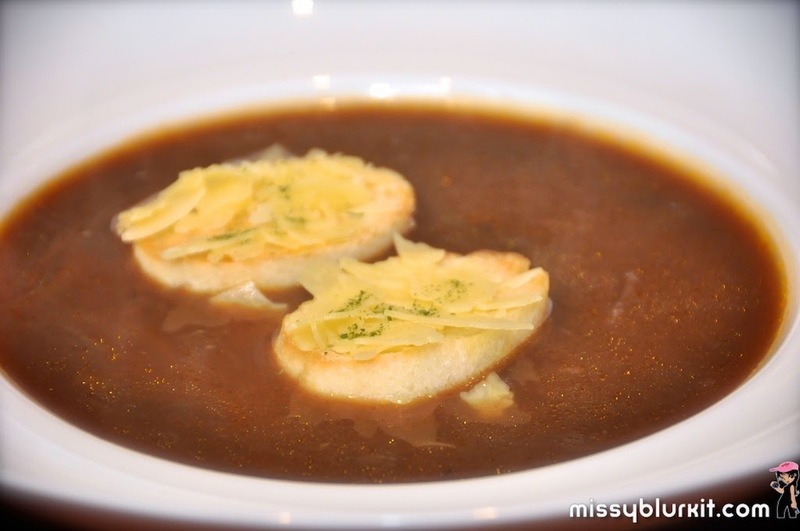 A choice of 2 soups - Wild Mushroom Soup with Truffle Oil and French Onion Soup with Cheese Croutons. Both were good but if you prefer something rich and lightly peppered then onion soup is absolutely perfect (especially on a rainy evening). 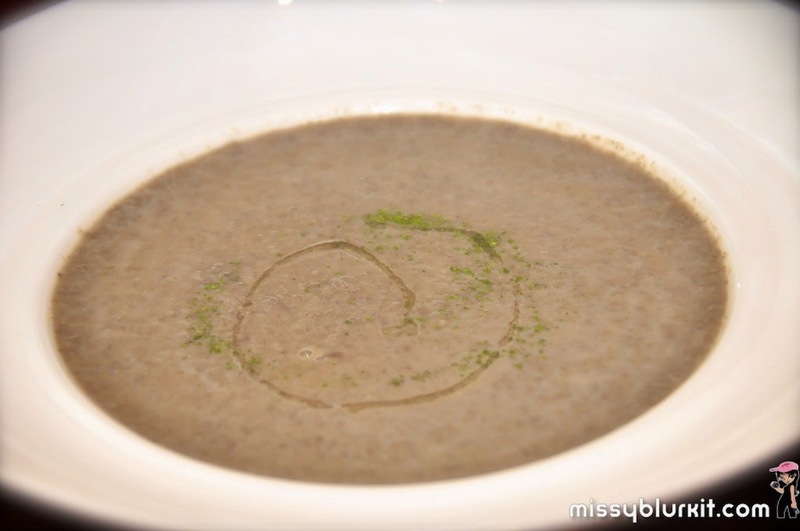 The Wild Mushroom Soup with Truffle Oil is prepared from scratch. It has a lovely bite to it and yes..the beauty of truffle oil!. Ask for some freshly baked dinner rolls to clean up the plate. Not one drop of this soup should be wasted! The French Onion Soup is comforting. Its not the usual clear broth ones but yet it has a nice clean touch to it. Am absolutely in love with the 2 thick chunky goodness of the grated cheese croutons that gives the onion soup more body and flavour. 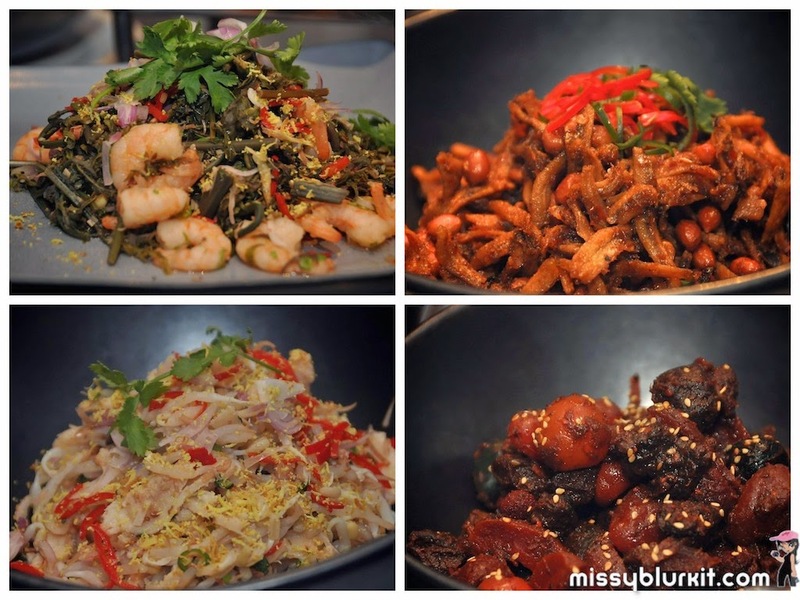 3 mains to choose from. We both wanted the steak and didn't fancy sharing our the steak with each other which I regretted when I saw the lamb come out. Dang!!! So much for not sharing! 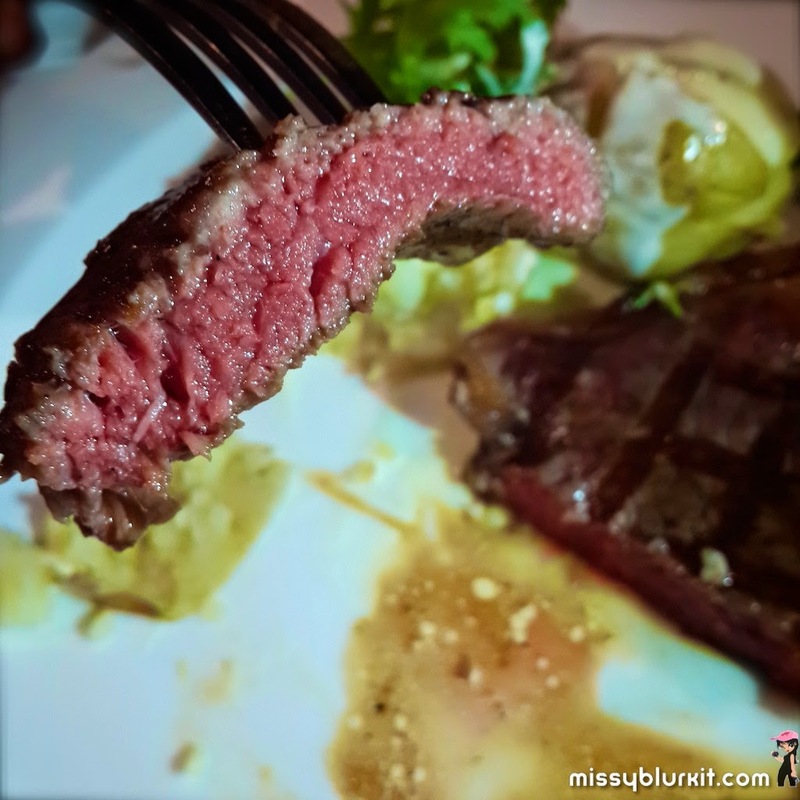 My kind of juicy steak! Both the hubster and I had our orders perfectly the way we wanted it to be even though I was busy snapping away! Brilliant job to the Chef Siti and her team!!! 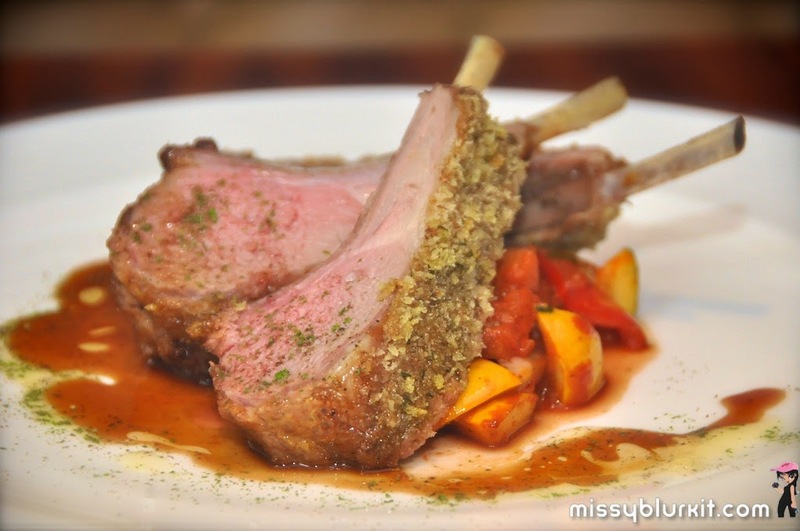 Herb-crusted Australian Lamb Rack with Ratatouille. Now you know why I regretted now ordering this? 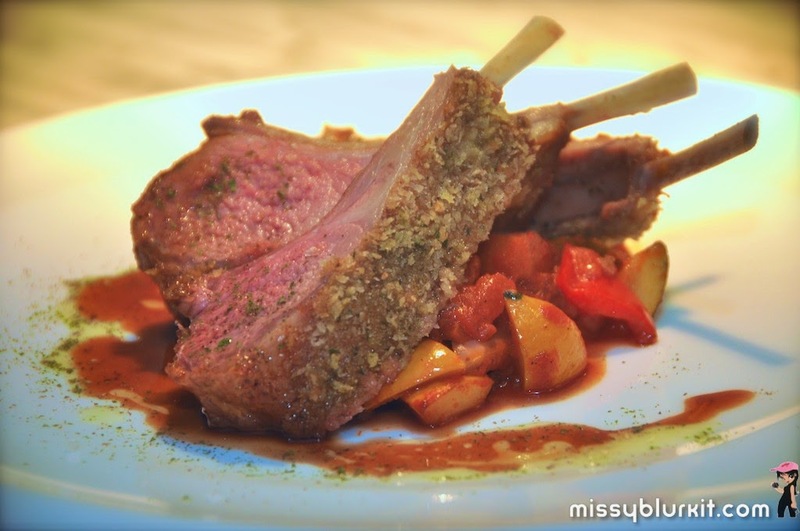 A lovely crust to go with the juicy lamb and nice healthy balance from the tangy ratatouille. 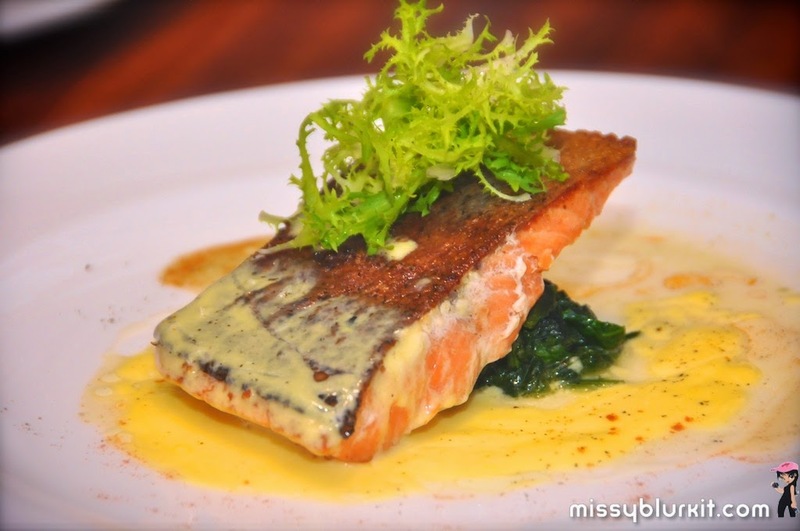 The Tasmanian Ocean Trout served with Saute’ed Spinach and Butter Sauce. Can't fault a healthy dish and its quite impossible to over cook a rich fish like the Tasmanian ocean trout. Could view that the others certainly had a nice crusty skin and flaky flesh for their fish! I am glad that I didn't have to make a choice for desserts. 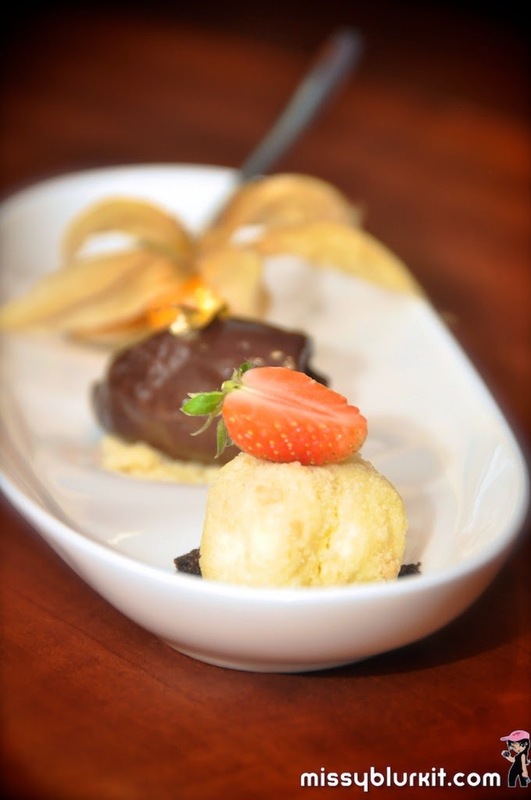 It was a pretty platter of 3 desserts - Cheesecake Bonbon, Toffee Creme Brulee and Chilled Chocolate Chiboust. My eprsonal favourite was the toffee creme brulee with a litght touch of salt! Yes...salt that gives it a nice balance of taste. Brilliant job again Chef Siti! 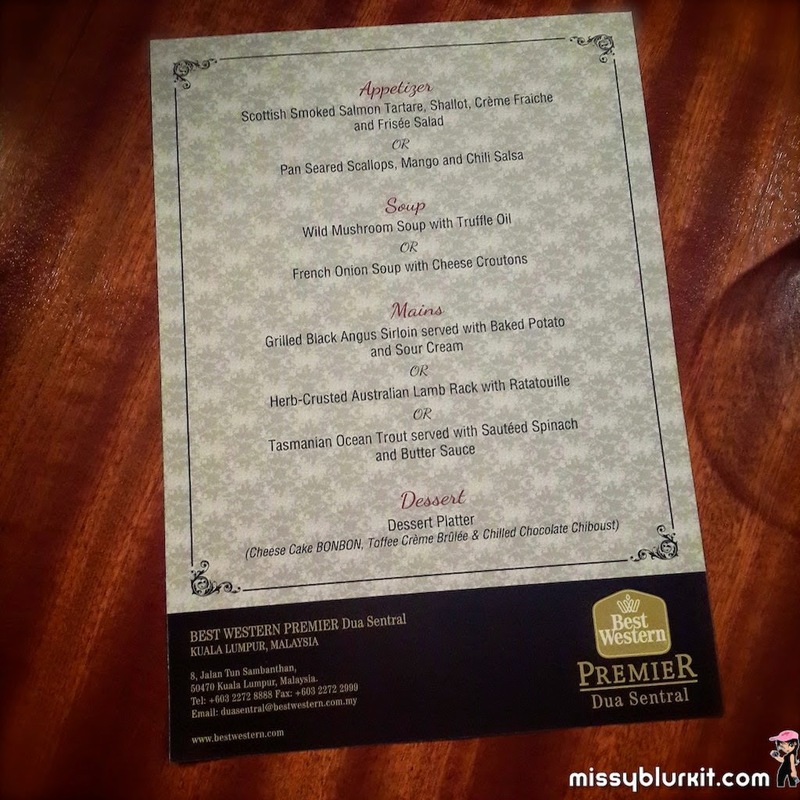 A 4-course dinner menu is priced at RM250++ per person with wine pairing or RM180++ per person without wine. An affordable deal I must say!